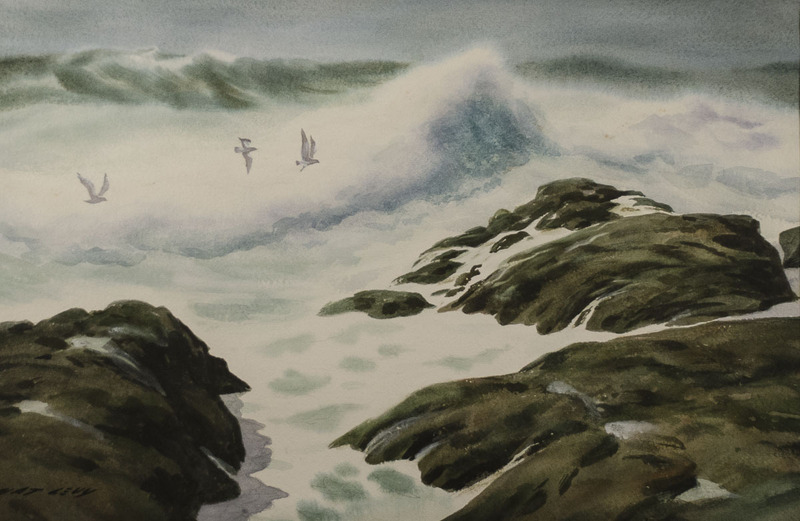 Nat Levy (1896-1984) coastal watercolor, signed lower left, framed 15 x 22″ sight. Nat Levy (1896-1984) Born: San Francisco, CA; Studied: Mark Hopkins Institute of Art (San Francisco), California School of Fine Arts (San Francisco); Member: Society of Western Artists. Nat Levy was born and raised in San Francisco and after attending high school, studied art with Maynard Dixon, Harold Von Schmidt, Armin Hansen and Frank Van Sloan. By the 1920s, he was an expert watercolor artist and exhibited his works professionally from that time on. His paintings were included in the thirteen watercolorists exhibitions. In addition to being one of the original members of that group, he was an early member of the Society of Western Artists and was the Society’s president in 1955. Throughout the years he taught watercolor painting and produced illustrations, poster designs and prints. He also traveled and painted in New England, Europe and the Far East.